This First Book of John is all about love, between two people, heaven and earth, the core of the earth and the universes and multiverses. Love is so expansive and unlimited that there is always more to experience and kow about love! Me: I was given a (voluntary) Reading by a lady named Tina, about a week after my dear wife Martine made her crossing, and it seemed that behind what Tina was talking about, there is a "divine coordination" (synchronicity) that allows things, even between different people's lives, to occur simultaneously or at least in a coordinated fashion; even though looking at them one at a time they seem to be independent.. Is that true? Dr. P: Yes, yes that's very true. It's really a matter of predestination and free will working together, all in one, in harmony. It's not one or the other, as many religions try to preach. This is because you have your own free will, but my goodness gracious, you're all made of the same stuff (called love). But, it is easy to be attracted to people with like mind and like heart, doing similar activities and whatever, but the soul and the breadth and the depth (of it all), the human mind really has a hard time comprehending. But the bottom line, and you do know I harp on this quite considerably, is that at your core, the core of everyone, is love. And those that are looking for a lover or somebody to be with and dance through life; it can be the first person you meet in the day. There's no reason why it shouldn't be, you see. But all the pretexts and expectations that people put upon love, on planet earth, is part of the explorations (of love). And you say, well that one's not lovable, and that one is. and you separate it out and then you say; you know it's an awful lot of work to try to separate it out; why not just love it all, you see? Me: Yeah, well that came to me several years ago... just to love it all. Dr. P: Yes. That's beautiful. That's a great title for a book! Me: Yes, I have thought, since that some people believe that this is a Mission Impossible ... "This mission, should you accept it, is to learn to love it all." Dr. P: Yes, exactly. Write the book, it'll be fabulous, my dear friend. Me: Yeah, I've considered that a few times , for about 15 year). I just haven't decided what to put in the book. It's something about love ... a book of love. Dr. P: Start with the way in which you and Martine met. I might add that two other mediums have also encouraged me to write this book and I also have the non-invasive "help" and encouragement of my dearly departed former wife to aid me along my way. Congratulations on your new book! IWent to your website and was drawn in to your words. Good job!! Me: And, (it seems that) I can have more compassion as I express a little more passion. The two go hand in hand. Me: Yes, thank you for that! This helps me see our relationship in a slightly different light than I was. So, what you said I knew, but thank you for explaining it that way. (6:27) I talked about love in the book that I wrote and now I’m actually beginning to experience exactly what I wrote about. Me: That’s an interesting thing. This is the perfect book to appear on this website! My writing of it has beem a Spiritual Healing - part of tge name ofthis website. And. in the book, you can see my love and artistic abilities in words, pictures, drawings and a painting. VIOLA: Spiritual Healing and Arts! Then as you read te book, you can do this in reverse, starting with the art of words, writing and pictures, which hopefully will open yourr eyes and heart to a large rworld; thus you experience a Spiritual Healing! I am giving you a peek review of a few selected portions of my book, so you can have some sense of what it is about and how I treat the subject. This way, you can better evaluate your purchase. Through the years, Rev.John M. Kohlenberger has authored many newsletters for sports car clubs, art associations and church groups. In addition, he has authored technical manuals and government reports. As a scientist, engineer, professional artist, computer programmer, technical and spiritualist writer, metaphysician, student of the divine, and Spiritualist minister, he expresses some unique perspectives on life and living in this, his first book. In this book, Brother John, as he likes to be called, shares his experiences as he has journeyed this earth in love with his soul mate. His experiences are examples of what is possible for you, too, as you live your life in love. I will begin this Dedication with a conversation that my former wife Martine and I had, on 2015-08-16 @ about 12:45 PM. I’ll let you decide whether this was a “real conversation” or if it was just a figment of my mind or imagination, as she was no longer in the body when this occurred. Me: I can allow you space in my books to express or indicate more of your love, even though you won’t leave it by your physical presence. We can still do this together. After all, our time together was one of love expressed, giving and receiving in the best ways we knew then. And this interchange has continued, beyond your so-called “death”. So, in this book, though I am the physical writer, I have left space, here and there for my former wife’s presence, that is still in my heart. In this way “she” may leave a little more of her legacy of love on this earth. Me: Several people tell me that, “You have a lot of work to do”. Dr. Peebles: Well, you have to look at it like this; you already know what that is in your heart, so it’s just a matter of cleaning up here; and getting the church taken care of and getting somebody there to replace you so that you know that you left a good strong legacy. And, that’s very important that you leave that legacy to the earth. It’s something you decided to do before you came to the earth. Martine is laughing her head off over here, she says, “Erect a sculpture of you and me together”. Interestingly, as I was putting the finishing touches on this book, I realize that, the photo on the cover, the graphics inside and my words in this book are that sculpture! So now, you are viewing a sculpture in words and pictures. 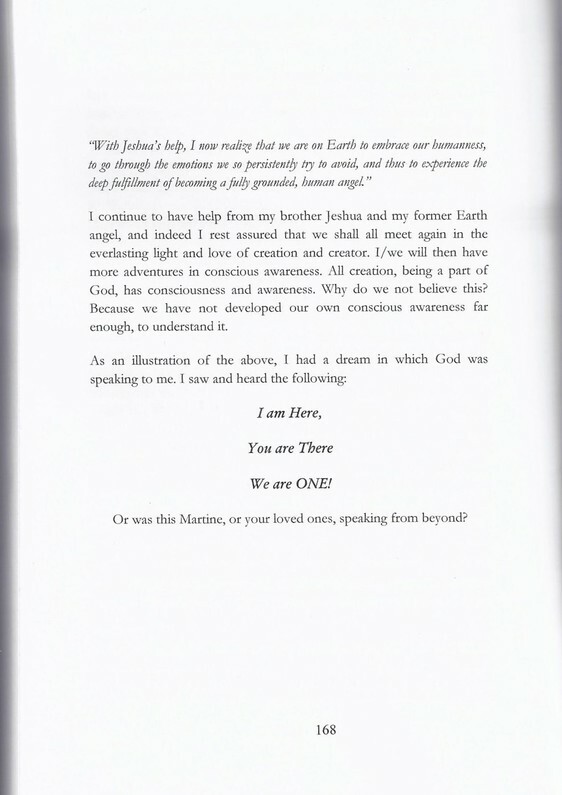 While this book is dedicated to Martine’s and my grand journey together upon this earth, it is being written as a celebration of all of life, everywhere throughout the universes and all of existence! As we, here on earth, celebrate Life, we open up more opportunities to find increased life, light, love and inspiration, beyond our wildest expectations; as has happened in my life and my relationship with my former wife, Martine This all happened during my near life and her near death experiences that I relate in this book! You may wonder what a near life experience might be. In this book, you will find communications between what we call the living and the dead. As our energies come together for this communication, Martine has to shift her vibrational frequencies near this life and I shift mine nearer to what we call death. This is like tuning your radio or TV to a particular station. Thus, refer to Martine’s communications with me , whether direct, through a medium or channeler, as viewed from her side of the veil, a near life experience. Because of all the good times I have had in life, along with the bad, and these new awarenesses, I thank All-That-Is for this life and all that it is. Viewed within our unlimited universal consciousness, all experience, whether dead, alive or fictitious, is part of everlasting life; which may be experienced in one form or another! 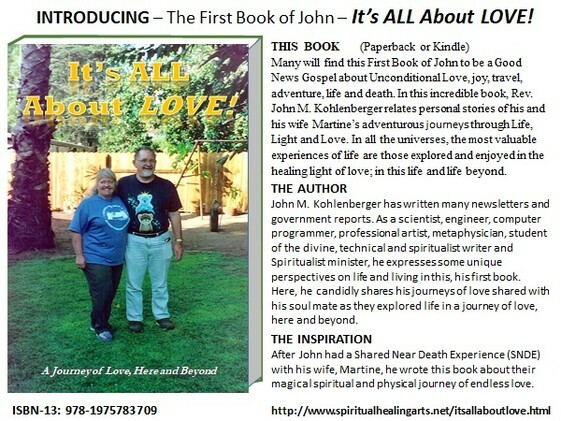 So, this book is centered on the love, light and life that I have shared with my beautiful Earthly and now Heavenly, Angel, who was known most recently upon this world as my wife Martine. She is currently manifesting and always has been active within other worldly energies. As souls, we have been together many lifetimes, on earth and elsewhere, before and after our recent human adventure. For, love abounds throughout the multiverses, allowing us, as souls, to experience lives, or existences, in everywhere and every when that we desire! For God-Goddess and their energies of All of Creation is Infinite, Eternal, Immortal and Universal. Une vraie histoire d’amour n’a pas de fin! Somehow, a True Love Story never ends! NOTE: I have also created webpages describing this at: www.SpiritualHealingArts.net. You may want to review these pages that are presented in honor of Rev. 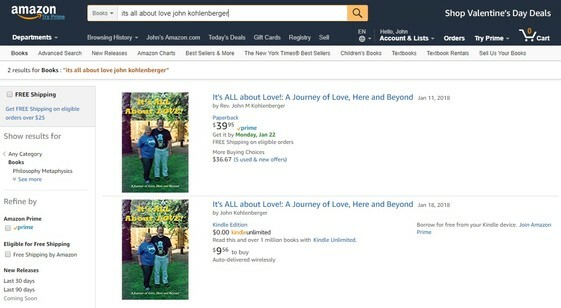 John & Martine Kohlenberger and our wonderful coming together, dancing together through life and then parting in Unconditional Love. Is it impossible to experience True Love on earth, as some people assume? Is this really a mission impossible? Is it impossible to love another without getting hurt or hurting the other? These are questions that I have been trying to answer all of my life. I was beginning to find some answers when my earth angle, Martine, first came in to my life. At the time, I was a facilitator in a singles discussion group and the speaker for the evening. That is when she first heard me speak of love. So now I invite you to read this book to find out the rest of this story. Many people believe that loving and being loved without heart ache and pain are impossible dreams! Movies portray this with graphical imagery, adding to the idea that love is a source of doubt, fear, frustrations and anger. Thus, your subconscious may say, “I saw it on the screen so it must be true.” However, there are many people who, at the same time, are quite enamored with the beauty, trust, joy and wonder of love. So, as you read this book, I think you’ll find that there is a positive side to love which enlivens us. This side of love is joyful, trusting, believes and supports us, one by one, two by two and all together. In any case, at age 14, I was told by my guidance that our beliefs cause the way we live. (Believing = Be-living). Change your beliefs; and you’ll change your way of living and your life will change! After considering the alternatives, yes I did accept! As you might imagine, keeping this “pledge” hasn’t always been easy. After all I had to accept the bad, the ugly and even death of my beloved wife. Along the way, however, there have been many rewards which I could not have dreamed of as I took that pledge and initiated this processes which has brought some of those rewards into my reality. This has been and still is a courageous journey to my own heart, into the heart of Creation itself and possibly to the heart of God-Goddess/Creator, the One, I believe, loves it ad us all - as part of self. This book, being a testament to this pledged lifelong commitment, might be called my Gospel of John (“Gospel” meaning “good news”) You might say that that you are now reading my New Testament of Life., This book, however, is not intended to be any kind of new Bible or holy book! Remember; all books have the potential to be holy books, as each contains some revealed truth. Whatever truths you find here, you are welcome to keep, until you find better truths. Let me ask you, “Is loving it all, the whole world and all that is in it - the despots, rapists, pillagers and the murders - even possible? And, how about the politicians, or others that we have chosen to call our “enemies”? In order to fulfill this mission of love, one must realize (real-ize or make real) the idea that love is an energy existing within every living thing, and even within the non-living. As love exists in everything, this new awareness of love must be brought forth from within, which can be done at any time, or we can hide your love under the bushel. As each of us learns how to be open to love, we become in “acceptance” of what we will expose of self and what we will accept as our reflection from others. Because of our old fears, beliefs and resentments, we create barriers, borders and boundaries between ourselves, each other, nations and even life itself. These then become tee source of our inhibition to love. Thus, we limit ourselves from a feeling of being interconnected in love, though we are, spiritually speaking. Often, we must dissolve or break these barriers to find the love that we need and seek. As we eliminate our road blocks to love, we might even find ourselves touching the face of God, or being touched by God and goodness. I’m sure that you’ve heard the expression that we must “love others as yourself.” Many think this is a commandment, but it is also a truth. Even murderers are (not) loving others as they are (not) loving self! If you are going to make the best of “loving others as yourself”, then you must begin by loving and accepting self, just the way you are now. In this way, love begins within and expands outward so there may be an expansion, even an explosion, of love. Where two or more are gathered, love is there. They would not have gather together if they didn’t love something, whether that is each other, an idea, an event even if it is just a social gathering. So, what is “love”? Viewed as the energy of the universes, love is the quantum and spiritual energy of communication and communion. It is therefore an attraction within all of creation. Just, as implosion creates explosion, love allows creation to extend beyond all limitations of space, time and whatever other label you want to put on unlimited divine creative energy. These are some of the factors that give love the power to be so magically and magnificently transformative. On a much grander scale, then, love is not only within your heart, but it is in the of heart of humanity. It is also in the heart of the earth, and the heart of each creation upon this earth, including the air, the water, and each mineral, each plant and every human being. When we allow love to flow through our hearts, we enable it to flow from our soul source. Hold this book in your hands, and let it touch your heart. This can happe whether you pay full price of buy it at a discount price. Even the Kindle version may inspire you to live in greater and greater love ... electromagntically! Written by a man who wondered, as a boy, what Unconditiona Love was and, guided by God in his life, found out. Greetings of love to you this day! I was up early this morning, adding to the last chapter of "my book" ("It's All About Love") , because of a dream sequence I had just experienced before sunrise. Yes, our human potentials are constantly developing, so despite the great experiences we've already had, our best experiences are yet to come, as we each grow and develop further, beyond where we are right now. And, yet, where we are now may have potentials that we never saw before, potentials that when realized may put us on a whole new understanding that we may be experiencing situations better than we thought, even right now. I'll give an example, here, one that was shown to me in a dream, by my former wife, now my angel, that I knew and loved for over 20 years as Martine. We, as human beings, often find ourselves in situations where we are required to work , shop and live with other human beings. We tend to look at these situations with an attitude of "let's just get this done". Some will look at these situations and think, "Here we are together, randomly arranged, and we'll get through this and then go on to something else." But, what I was shown in this dream was that as we go about our days, through our situations, seemingly very down to earth, there is an energy that is being exchanged, one to another , back, and around throughout the group of people you are with, at any time and at all times. And this is the energy of love. Viewed from what might be called a "balcony seat" where all of us go eventually, as we exist in the afterlife or angelic perspective of love, we are really in these situations to express , exchange and feel the love that we truly are. This is why, Jesus, who lived in an "elevated" awareness of love, so he healed with love, spoke with love and was love lived and expressed through human flesh said, "Where two or more are gathered, there I am." There, and even here where you are, is the love of Creator, that you too are a part of; both Creator and Creation, all of which would not be without love. You, too can be open to that higher awareness, as he was, simply by lightening up a little more in life, stepping away from all the judgments and looking for, feeling and being the love in any and every situation you are in, each day. Is this some unachievable "pipe dream"? Well, while it might seem that way, if you thought you would just magically become this way overnight, nut I, you, we can do this by becoming aware of the love, the love that resides in each one of us, by raising our awareness one small step and situation at a time. So, today, I am planning to try to see and be the love being exchanged, in any and all (if possible) situations, as I go out and step into my day. You, I, we are eternally valid and supported by the universe of which I, you, we are a part. Thus I, you and we, each and every one, all exist both within and beyond physical existence and expression! And, IT'S ALL ABOUT LOVE! I now challenge you to go forth and BE the love in your day. I am taking this as my personal challenge. And, my angel told me it would be good for me! Sometimes life has to come apart so we can put it back together! After my former (2nd) wife left the state for greener pastures, I was alone and single. What to do now? Well, I knew that my life wasn't dead by any means, it was just in transition. So I continued living in the same home as I had with my former wife, continued working at the same job and drove the same Dodge van which was my first new car. Then, since a lady friend in the art association that I was then president of invited me to a Singles Dance, even though I didn't know how to "dance", I went to meet her there. So, there I was with a bunch of strangers, but at least I knew one person in the room. I felt safe, even though I didn't know what to expect. Then, as this gave me something to do while living alone, I started going to these dances regularly. But, though I was with a group of "singles", like me, I didn't find anybody particularly attractive that I wanted to ask out for a date. But, as with any "loss", whether through disease, death or divorce, there is always a healing time which usually begins with a sense of numbness, being in limbo or just plain regrouping to see where to go from here and what to do next. After a month or two of formal "ballroom dance" lessons, I realized that very few of these singles knew how to "formally" dance, as they just moved to the music. And isn't that really what dancing should be all about; enjoyment, letting go and being moved by the music as two people moving together in a kind of oneness? After a short while of attending the dances and joining the "Breaking Barriers" self-help growth group that was lead by the sponsors of the dances, I became involved in a relationship with a lady, I'll call Nancy. That relationship lasted for a couple of years, with many memorable and pleasurable moments along the way. Certainly it was the right thing coming along at the right time for both of us and so we enjoyed our relationship for those couple of years. During that time, after attending the Breaking Barriers discussion group for about a year, I was invited to become a facilitator. The job of such a facilitator was to give a presentation to the 30 to 50 people that normally attended the group, about once a month, and then be the leader of one of the smaller discussion groups that we would, by lottery, break up into. In these smaller discussion groups, we would discuss that evening's topic or any problem that a person in that sub-group might have. It was sometimes like a group therapy session. Well, my relationship with Nancy grew closer and we had fun and enjoyed our companionship until one day, when, though we had discussed marriage, I realized that she was not “committed”, and that was something I was looking for in the relationship and possible marriage. And, as I write this, I realize that maybe she was not finding something in the relationship that she wanted, so after all, it was destined to come apart at some point. Likely, there was something "lacking" in it, for each of us ... for each of our souls. While great in many ways, it was not completely satisfying to both of our souls so we took a break for a month or so and didn't see each other for a while. You might say, we "broke up" for a while. During that time, as it seemed that our being together was not headed to being the "committed" relationship that I wanted, I prayed to be guided and that the universe would help me, to find the one that would fulfill that dream, so I could feel some love and peace in my life. One evening in January, while Nancy and I were apart, as I was outside my home in the back yard, I "wished upon a star"; probably Jupiter or Venus, that God-Goddess and the Universal Forces of Love would bring my perfect "mirror" to me so that I could grow some more, with her, in love and joy. So it seems in hindsight, the Universe was working in my favor, as one morning, while driving to work, over a hill and down a canyon, I was wondering if I would ever have a long-term relationship. and talking to the Universe, my Spirit Guides and a guide called "The Old Chinese" about this, wondering when and who it might be ... all of a sudden, as I was coming to the bottom of a hill where I had to stop at a stop sign, I suddenly noticed there in front of me was a blond lady driving a white Honda. Could it be her? As I looked at her from the back of her head, I wondered, as I felt a special energy in that moment, I wondered if she could "be the one". And, from my studies with The Old Chinese Taoist Sage, some years before, I felt that it would be good for me to meet her to see if I like her, as I thought, "maybe she would be a good mirror for me", i.e. a good match for learning and growing through a long-term committed relationship. But, as I didn't want to run her off the road to meet her, I gave my wish, and this job of meeting her to The Universe or God and my Old Chinese Sage, trusting that the forces of nature and love would work out our meeting, if my feelings were correct. While Nancy and I were not actively involved in our former relationship, I was on the phone with my brother one afternoon and he mentioned a book to me called, "To Dance with Angels", written by Don and Linda Pendleton. This book was about some channeled spirit teacher named Dr. Peebles. What my brother told me that day sounded interesting, so as he was telling me about the book and was quoting various passages from the book, I became interested in the fact that it seemed to deal with human relationships in a new way that I was not familiar with, and I wanted to know more. So, though he told me "It's a brand new book, you probably can't find it anywhere”, I decided to drive down that same canyon road where I had seen that lady that caught my attention, to the nearest book store to see if I could find a copy of this book. After hanging up the phone, I immediately drove the 17 miles or so, to the nearest Barnes and Noble book store, and as I walked to the section where I thought it should be, there it was, my copy, on the shelf, in front of my eyes! More often than not, if you'll notice, the things you really need just fall into your life, on schedule. When it happens, don't doubt it, accept it and thank God, the angels and all the other Universal Forces of "providence", that actually do provide for us. Well, I began to read this book and found it uplifting, fascinating and amazing. that this human named Thomas could bring humanity what seemed to be "messages from the angels", through this angelic partner named, Dr. Peebles. After about 6 more months of my trying to put our relationship back together, one day, as I felt it wasn't leading to where I wanted it to, I broke it off, moving all my things out of Nancy's home, back to my own house. And that was the end of that! Strangely enough, or was this by the design of divine guidance, I had consulted a psychic at a local gathering of intuitives just the day before I moved out of that relationship and this psychic, named Celeste, painted a glowing picture of a wonderful marriage with lots of travel and love given and received. But, as I now reflect upon those times and situations, I suspect that deep within my soul I knew that the existing relationship was not the one she was describing, but instead, it was the next one to come along on my individual divinely inspired path. Each and all of our paths are divinely inspired, by the way! Now, this is a good place to point out that in the greater scheme of things, change has its place in our lives, as it keeps us alive, moving and out of ruts. Nothing stays static, for if we were static, we couldn't move, we wouldn't be breathing in and out, our hearts would not beat to keep our bodies alive and vital, and our blood wouldn't circulate, so we would die. Living, loving, laughing and even crying all require movement, for these are energies that are divinity expressed upon the earth, as love moves. All this causes creation, growth and change and that is a part of who we really are ... not only here on earth, but forever. Looking back on those days, I realize that as a result of reading the book, "To Dance with Angels", and eventually contacting the channel, Thomas Jacobsen, it put me on a new path of understanding and love, better than I ever had before. Ever since then, Dr. Peebles has been instrumental in helping me understand God, Love, Life and Self. So, yes I did eventually meet this blond lady driving the white Honda, though it took me a couple of years to put “white Honda Accord” together with the “blond Lady” I had, by then, living in my home with her dog Darty. And I discovered that with the help of God-Goddess, our angels, guides and loved ones (not all in this world) that Dreams Do Come True! This lady, Martine, turned out to be the angel of my childhood dreams. Thus, as I had more grand experiences with this earth angel, there are more stories of love, like this one, in this book. And though my former earth angel has gone back Home, now (as I write these stories) I have met another angel here on earth! What a lucky guy I am! Two angels in one lifetime! The thought of all this touches my heart and brings tears to my eyes as I write this. And, to think back to the days when I was in Thomas Jacobsen's, "Journey to the Heart" group, and I was known as "Tin Man" (a man with no heart), I must have grown and changed over these many years! But, now as I recall those days in that growth group, I remember that I had also just met Martine at that time. And, I am finding that meeting angels on earth is humanly possible, after all! I have since learned that it is between the light and the dark, going through the ups and the downs as well as the side to sides, with a little more of this than that, that life takes place and our souls grow. Our emotions are expressions that come from the energy of our souls. Though exposing these inner promptings can seem to bring pain at times, as energy loves to flow, "All Feeling is Healing" and so it is that we must bring out what is within so we can heal. Even, going to the doctor or dentist can be painful, but you, I and we go there to heal. Just before I met Martine, I had decided to attend a "Journey to the Heart" spiritual growth group, based on the wisdoms of Dr. Peebles, facilitated by Thomas Jacobsen. As stated earlier, Dr. Peebles encourages us to reveal the various emotional aspects of our lives. Tn this group, we were helping each other discover who we were. During that process, we/I discovered that my emotions were nearly inaccessible at that time; thus I came away from our meetings with the nick name, "Tin Man". But, looking back, that was why I was even there in the first place, because I sensed that, though I had grown very much intellectually, I now needed to grow emotionally and spiritually. What perfect timing and naming! I was about to start a new journey to my heart, both with myself and, lord willing, with this new French lady friend, named Martine! Over the previous few years in my job as a Computer Engineer, in a top secret environment where I could not even talk about my work, I had become a Technical Writer and Artist. Though my life path was seemingly changing, it also seems that I have always been a writer and an artist, so this role fit the spiritual side of my personality perfectly, much better than the logical and precise computer engineer I had been for the previous 30 years! Thus, my salary was able to tide us over while Martine was between temporary jobs, eventually finding her next full-time job. Looking back, the puzzle pieces of our lives were fitting together perfectly. Believe it or not, this is the way God and spirit work to help us get through life, successfully, if we don’t “fight life”. One evening Martine, invited me over to her house for dinner. Interestingly, to get there, I had to turn on Avocado Street. I mention this now, because ever since that evening, I realized that "avocadoes" were important in our lives. This was just the beginning! So, since Martine had learned to cook the French way from her mother and later earned a chefs diploma in San Diego, she was an excellent cook or should I say, a fantastic chef? Need I say that her dinner that evening was terrific? We ate fish, and as I remember, my dog Missy even liked Martine’s fish! When I told Martine of my surprise that Missy liked her fish, she asked, "Well how do you cook your fish?" I replied, "In the microwave." Then, she told me that "You never cook fish in the microwave as it dries out too much." She always cooked her fish in the skillet the French chef way, with wine and sometimes scallions. After dinner we sat on the couch to talk and get to know each other better. At some point, she began asking me some pointed questions about myself and then started telling me about some of my characteristics. As we talked, I wondered how she knew all these things about me. When I asked her how she knew all these things Martine explained that after she had asked me about where I was born and when, a few weeks before, she had then sent that information to a company that makes astrological charts and then, as she had previously trained as an astrologer, she “read” my chart to find out who I am and know all this information. I was amazed! I told her that it seemed like she knew more about me than my previous wife of 8 years ever knew! So it was we began to feel "comfortable" with each other, so our friendship could grow in honesty and trust, with nothing to hide. Martine dressed for our first date. 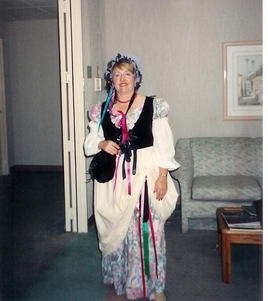 This is a picture of Martine dressed for our first "Date" as we were about to go to a Halloween dance with other single men and women that we had been to several tomes before. This was our first time going there as a couple. I was dressed as a poorer man, but still of the same time period. So, on our first "date", we went to a singles Halloween dance as a couple, Martine dressed as a well to do lady European of the 1800s (pictured) and I dressed as a poor surf from the same approximate place and time. We had fun that evening, just being together at the dance! Many months later, Martine lost her job as Accounting Supervisor with a home builder and had to rely on unemployment for her income. It was then that her financial woes started. However, as our relationship had grown, we were now having dinner together regularly at either her home or mine. So, one evening while she was trying to find a job and I was still fully employed, she offered to come to my house to fix dinner. So, we agreed to meet for dinner after I got off work, at my house that evening and thus, my dog Missy was staying with Martine that day. Since Cockapoos are smart, by now Missy had learned what a good chef Martine was, so when Missy saw the fish, skillet and the bottle of wine going into the car from Martine’s kitchen, she jumped into the car right along with the dinner preparations. Now, I did not know that Missy liked fish, but as Chef Martine had to inform me, it appeared that as I had been making my dinners in the microwave, Missy decided that pan fried fish was a much better option! Eventually, after a few months of looking for a new full time job and only finding part time or jobs that pay by commission, Martine realized that she could not keep up her house payments, even though as an employee of the homebuilder she had received a 10% price reduction. Then, she found an ad for what appeared to be a homeowner “under water” relief plan for her house that she could no longer afford, so she signed her house over to Boston Harbor who claimed that they would take over her home and she would not have to make any more payments if she would sign it over for them to sell. But, as it later turned out, what seemed too good to be true, was too good to be true, and they just took her “fee” money for nothing and her home ended up being repossessed by the lender. So when we learned that his was a scam she saw no alternative but to declare Bankruptcy! But, as I had a large home and my step children had just moved out, I offered Martine the option to come to live with me. After thinking that over for a few weeks, she took me up on that offer. In the meantime, as Martine's unemployed woes developed, she was now also getting behind in her car payments, too. As we seemed to be building a close trustable relationship, I offered to pay off her car loan so she could keep her car so she could find and keep a job. But, as my heart said I should do this, my mind wondered, "What am I doing this for? Am I crazy? I’ve known her less than a year and I don't know if she will come out of this or not. She could just be taking me for a ride." I did not know why I was doing this other than it just felt like “the right thing to do!" Something deep inside me (my soul) must have told me that, because I could almost hear my parents, if they were still alive, saying, "You hardly know this woman. You are a fool to pay off her car." Sometimes, in life, you just need to follow your heart, and not what others tell you or your childhood programming. It was then, that we finally, officially, moved in together, she with her with her dog Darty and I with my dog Missy, all together as a family in my home, not far from the Denny's Restaurant where we had first met to begin this journey and relationship, which as it turned out was the realization of a long held dream of my lifetime, since I was 4 years old. I finally realized that this just might be the French lady I "hoped" to marry in this lifetime, when I was age 4. If so, it had taken me just over 50 years to realize this dream! And, it may be that after she had asked me how long I had been at my job, a few months before, and I had told her 11 years on the current job, and then informed her that I was at my previous job for 17 years, she just may have thought that as I seemed to be able to make a long-term commitment, so she could also think about one with me. She did tell me, at the time of that conversation, that as a supervisor interviewing a prospective new hire, she would hire me, because it was likely that I would stay and she would not have to be retrain a new employee to replace me, even though she told me that she had moved from job to job to try to build her income. Then, one evening, as I was arriving home from work, it dawned on me, seeing her white Honda Accord sitting in my driveway, that she was most likely that blond haired lady that I had pulled up behind at the stop sign on my way to work, especially as we both took the same route to work and we had likely stopped at the same stop sign, together, about 2 years before! This is the way that God and spirit bring people and good things together in our lives, but most people do not believe that their thoughts and dreams have anything to do with their lives, if they even remember having those thoughts, dreams and experiences, years later. Luckily, I did! So, eventually, Martine found a temporary job, as an accountant, in a beach area of southern California, off of Avocado St., in a very fashionable part of Orange County. Being the type of person Martine was, she loved being in areas like this, thus we enjoyed several nice lunches or dinners at some of the upscale restaurants in the area. As Martine loved food; its preparation, presentation and the tastes involved in fine dining, going to chef’s school had to be a part of her life. However, as I was the son of a professional doctor, our family culture told me that with my good education and job, I would never be unemployed. Never say "never". For, as the defense and missile business took a downturn, I became employed, just as Martine had when the home building market shrunk. But by now, she was regularly employed, in charge of the recreational and charitable side businesses of a company located 50 miles away from home, so together we could survive, with her income, my unemployment checks and my line of credit. Then, as I was unemployed for 18 months, even with some funds to go to school for job retraining and Martine's income to help pay the bills, I/we ran up over $30,000 in debt on my credit cards. Could I ever pay this off? Well, I have learned through these and other experiences that the only guarantee that life gives us is "You'll get through this ... somehow", and so over time, together as a team, yes we did! Eventually, I found a temporary job 90 miles and 2 hours away from home, but that regular income, for however it lasted brought in more money than unemployment, so I gladly took it, despite the cut in pay from my previous job, the long hours and drive into the big city. As that first temporary job, in the computer networking field, ran out, another job appeared, also in the big city, but this one had better pay, more hours and a more regular schedule. Instead of being a computer software engineer, as I had been for 40 years, I was now dealing with computer hardware and networking. Then, Martine found a job temporary job, closer to home, at an Avocado company. I loved having avocados in my salads, so for me, this was an ideal situation. And, though temporary, this job soon became permanent, as they liked her work in accounting. Soon after that, as I was laid off of my previous job, I soon found another computer networking job that was described as "40 hours, temp to perm". Though I was still in the computer field, I had taken a 40% pay cut from my previous position as a Fortran Programmer. But, as Martine said to me, soon after being laid off that job, "You're job has become like the dinosaurs, with technology changing, it is becoming extinct." So it was time for me to move on into the computer networking age ... as I had considered doing at least 10 years previous, but didn't know how to make that transition. Now, the Universe was making it for me! So, I became a computer network designer and installer for the new top secret Air Force F-22 facility at Edwards Air Force Base. Now, with both of us employed, one night, Martine's white Honda was stolen from my driveway. As my Dodge van was getting old and she needed another car, Martine decided that it was time to buy, not one, but two newer cars. And since she had heard that Hondas were the number one most stolen car, we went to a Toyota dealer. I was able to buy a new medium size car and Martine, due to her bankruptcy, had to buy a smaller used car at a high interest rate, but she saw this as her first step to "credit repair". And, as it turned out, it was! Yes, we were turning into a team that could get through anything! I would learn, over time, that this lady, Martine, would turn out to be the angel of my dreams. Thus, as I had more grand experiences with this earth angel, there are more stories of love, like this one, in this book that could be told, but there are too many for any one book. And though my former earth angel has gone back Home, now (as I write these stories) I have met another angel here on earth! What a lucky guy I am! Two angels! And, if this new one doesn’t want to dance through life with me, there may be others! God and spirit really have no limitations, borders or boundaries. The thought of all this touches my heart and brings tears to my eyes as I write this. And to think back to the days when I was in Thomas Jacobsen's, "Journey to the Heart" group, and I was known as "Tin Man" (a man with no heart), I must have grown and changed over the years! But, now as I recall those days in that growth group, I suddenly remember that I had also just met Martine at that time. I was ready for growth in new ways! Thank you again, God-Goddess, Angels, Guides and Universal Providence! Feelings do have validity and dreams do come true for those willing to invest their energies in the time, hope, faith and confidence!
" It's important to understand that when Martine came into your life and you came into hers, that it was two hearts that came together as the whole. Each of you have, unconsciously, been searching for each other, but each of you had to go through your separate experiences and adventures before you could come together and the time was right for you to meet." - Revealed to me by Chris Meredith, an English Spiritualist Medium, posthumously. Periodically, we each need to take time “out” for ourselves, to rediscover who we are in this moment and then simply accept who you are in this moment, let go, let God, TRUST and LET IT ALL JUST BE AND BECOME! From time to time throughout the eons of time, as we know the essence of our soul energies, we each come to earth to experience giving and receiving love; in the having, holding, touching, smelling, hearing, seeing and even tasting what we believe, in that moment, to be other than self, only to find that, like that image in the mirror, We Are One! And so, together Martine and I stuck it out through thick and thin, even with our ups and downs, agreements and disagreements, sometimes merely agreeing to disagree. Loving one another, no matter what, was one of the keys to our relationship as we forged ahead in our lives in a new chapter, together. After 3 years together as friends, we began talking about the possibility of marriage. I took a while to consider this proposal, as I wanted 3 years minimum of getting to know my prospective life partner before I could commit to a long-term agreement in marriage. A further wrinkle in my decision was the fact that my former wife, whom I had divorced even before Martine divorced her former husband, had the initials "MRD" before I married her and as Martine's initials were also, "MRD", so I wondered if I was about to repeat something that I did not want to? I had to weigh this in my heart and mind. And, so, one evening, knowing what the answer would be, I asked Martine if she would marry me. This began a whole new chapter in each of our lives, so we now had to plan and host our wedding. Thus, we searched for a suitable place, that as we discussed where would we (each) like to have the ceremony, it was easy to identify; in nature, in the forest, with the proper menu combining French, German and American main dishes, representing our individual cultural heritage, for our guests. This process took nearly 6 months. When Martine called her mother, in France, to tell her of our decision, her mother told Martine that I was "the right man" for her. How did she know? I suspect that she knew inside herself, by what I like to call "The Inner-Net". She asked how many years apart we were and when Martine said "seven", her mother said, "That's perfect, as that's how far apart your father and I were". Yes, Martine’s father, Pierre, whom I believe I met “psychicaally” as “Lucky Pierre” in 1976, the year he died, was also approving; if not even a party to us meeting! Finally, in our searching, we found an old hotel, in the mountains, built for the owners and bosses of the mines nearby and in the 1880s, it was also a brothel for the miners. It had a restaurant and bar, along with a nice outdoor patio in the forest for our ceremony and an upstairs private dining area (the former brothel) for our reception dinner. And the German chef at The Chefs Inn would make 3 main courses for that dinner; one French for Martine's heritage, a German dish for mine and an American main dish to symbolize our union in this country. We then set about inviting about 50 relatives and friends along with our good friends, Phil and Lois, who were to be our ministers, from the Spiritualist Church we had been attending for nearly 5 years. For our wedding day, Martine's mother, Meme, was the only one of our parents who was still alive, but she could not make the trip by air from Paris to Los Angeles to attend our wedding because she had trouble walking and felt she just could not make it. The wedding party on the patio in the forest is pictured (below). The wedding party, in the forest as planned, featured Martine's "best friend" Carla and her sister-in-law Peggy on the left. On the right are my brothers David and Bill in the background, with my grandson Christopher and Martine's son Patrick in the foreground. As I write this, I feel that this picture is a fitting tribute, more than 20 years later, to family members who have gone on before us; namely my earth angel Martine and my brother Bill! Being the writer, artist and publisher that I've been most of my life, I made up the wedding invitations. And on them, Martine wanted the words, "Today I Marry My Friend" on the front of each one. On the morning of our wedding as I awoke, I was told by spirit that "The tall hats will be there today". This seemed strange, but then I thought of Abe Lincoln and his tall hat, and the fact that he is dead, and figured that some of our "dead" relatives would be attending this momentous family occasion, even if nobody saw them. Well, life events, including meeting my French dream girl, had helped me expand my life and open me to foreign travel. Right after meeting Martine I was invited to meet with a spiritual growth group in Washington state, across the water from Canada. So, naturally I had to see Victoria and Butchart Gardens in British Columbia! It seems that all this growth, spiritually and in love (which is one in the same thing) was a precursor to my expansion to venturing to other continents. Then, as we were getting ready the morning of the wedding, and about to go to The Chef's Inn for our wedding, Martine's sister called from France, telling Martine that their mother had passed away in the night. But, as we already had plans to go to Hawaii for our honeymoon and Martine felt that she could not add anything to her mother's passing, she decided to go forward with our plans to go to Hawaii for a two-week. Hawaiian Honeymoon. See Newlyweds (below), at Waikiki. Later, according to the English Spiritualist medium, Peter Close, Martine's mother, who had passed on in Paris, the night before our wedding, and her father, whom I had met while in meditation as he was leaving this earth in 1976, were both at our wedding. Peter told Martine that their comment was, "We were some of the youngest ones there". We stayed in Waikiki for our first week, touring the island south to north, enjoying each other and the tropical setting of this volcanic island paradise. Many times, as we were in the tropical forest, here or there, Martine would tell me that she saw her mother among the greenery, enjoying the flowers, just as my mother did when she visited Hawaii over 30 years earlier. As they had both "crossed over" through the veil, I knew that they were now good friends, if not before. Our second week was to be on the island of Oahu. Martine noticed, on out flight there, that the seat next to her was empty, just as it had been on our flight to Hawaii and again at the Luau we attended. Martine then remarked to me that she felt that her mother was traveling with us. So, one day, when on Oahu, we visited a multi faith cemetery. While driving around, Martine asked to stop at the Buddhist shrine where she had her own private ceremony for her departed (but still present with us) mother. I might add that our honeymoon in Hawaii was the fulfillment of two of my boyhood dreams; 1) of marrying a French lady and 2) of traveling to Hawaii. And then, Martine told me that though her former husband had promised to take her to Hawaii and never did, so it was I that actually did that. So a dream of hers was also fulfilled. 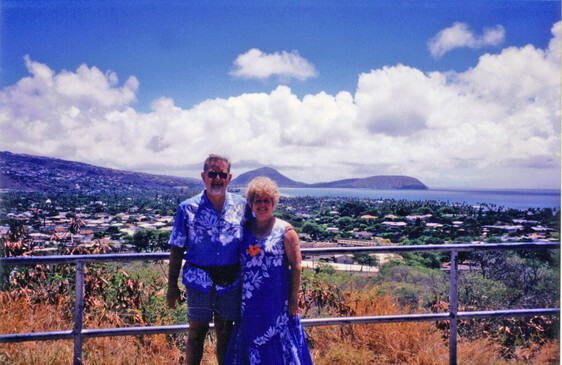 We did not know it at the time, but our honeymoon in the Hawaiian Islands was the beginning of our travels to other islands and other lands around the world. But, of course, movement and travel are often ways of celebrating love; for the world and/or with friends and relatives. Travel to anywhere may be particularly sweet when you travel with someone you love. YEARS LATER: After my beloved wife of 17 years had Graduated into the Greater Light of Creation, I was listening to some music from "South Pacific" on the radio and suddenly, I had memories of this wonderful honeymoon in the Hawaiian Islands, so many years ago. And, as I have remembered those times, in those moments, I have wondered why I did not appreciate them more. In some of those moments gone by, it seemed that often we go through life just accepting the gifts and joys of life, when if we would "stop to smell the roses", life would be so much richer and rewarding and we would realize how much love there is in the world. Love makes the world go ‘round. Thus, planets spin and revolve about stars. Even politicians like to put a spin on their words. And it all begins, and ends, with love ... a quantum, transformative, energy that exists in every heart and throughout all universes.